Giving birth to a bonny baby boy early this year was a truly a labour for love for Vanita Saxena. The 38-year-old Sharjah resident became a mother a second time when her son Vedansh was born 10 years after the birth of her older daughter. 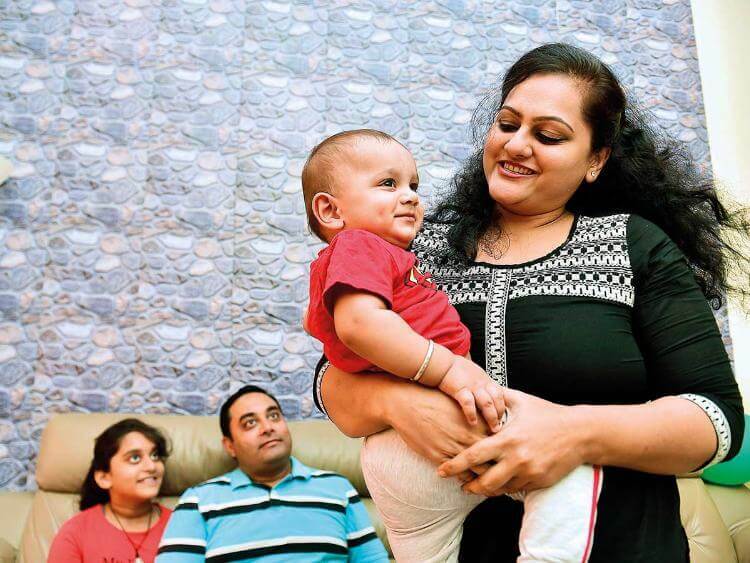 Being an insulin dependent diabetic with history of two miscarriages, motherhood was nothing short of a miracle for Saxena who had given up hope of going through a second pregnancy. Undeterred, she conceived again six months later, but this time she miscarried within eight weeks because of severe viral infection. “These two experiences had left me very weak and I was diagnosed with Type II diabetes. In the beginning, I was on pills and then was prescribed long acting insulin for the night,” said Saxena who was familiar with the condition as her husband Shantanu has been a diabetic for over five years. Saxena thanks her endocrinologist Dr Maneesha Pandey from Aster Clinic, Bur Dubai and her obstetrician and Gynaecologist Dr Stuti Mishra, from Aster Clinic, International City, who motivated and inspired her to overcome the fear of diabetes. 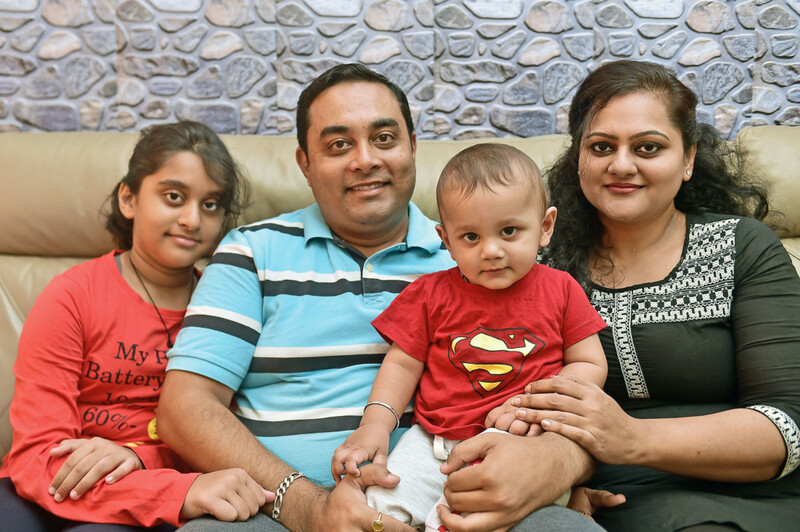 “Dr Pandey who was treating my husband encouraged me to go in for pregnancy and to give my best shot at being a mother again,” said Saxena who was able to conceive for the third time in May, 2017. “The first thing I did was banish all negative thoughts from my mind. With the help of my brother who is a nutritionist I drew up an elaborate diet chart and implemented it in my daily routine. I also began working out. The doctor put me on insulin injections with every meal to get better blood sugar control,” she added. 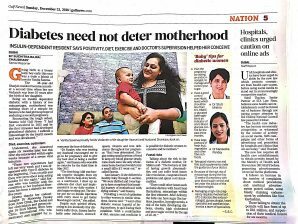 Despite such spirited efforts, owing to low immunity that diabetics suffer from, Saxena had to battle urine infection, stomach upsets, vitamin and iron deficiency throughout her pregnancy. “But I was determined. I began eating small portions of food to keep my blood glucose steady, I also made sure I ate only wholesome home food and would carry a small tiffin if I went out,” recalled Saxena. On January 11, 2018 she delivered a healthy baby through C-section. “We were thrilled and I was happy to have completed this beautiful and eventful journey of motherhood with flying colours,” said Saxena whose son is now 11 months old. Discussing the risk to the foetus of a diabetic mother, Dr Mishra from Aster Clinic said: “The foetus is at risk of having growth abnormalities, and can suffer from issues like retardation (more or less growth), congenital heart problems and spinal cord abnormalities. Apart from that there could other issues such as foetal distress with heart beat fluctuations, miscarriage within the first trimester, a caesarean section delivery. Even after delivery the baby can have sugar fluctuations, jaundice, hypoglycaemia, a risk of the baby developing diabetes if sugars are not properly managed, and a risk of developing obesity, high cholesterol and poor sugar control by the age of 20-25 years. Dr Mishra added that pregnant mothers need to handle more challenges such as back pain, heavy weight, difficulty in moving around, urine problems like passing urine, swelling in legs, sleeplessness, cramps and anxiety. •Plan the pregnancy by visiting an endocrinologist, to manage and control your sugar. •Have large portions of fresh fruits, vegetables and other fibre rich foods. •Be aware of the high risk of miscarriage during the first 12 weeks of pregnancy with poor blood sugar control and be under the advice of the endocrinologist. •Managing a high-risk pregnancy requires involvement of 2-3 doctors like endocrinologist, gynaecologist, heart specialist and paediatrician. Involve a team of specialists.